The season's changing and now is just the time to refresh your wardrobe. Stow away those woollies and take out your breezy dresses, comfy sliders, and floral everything. If you're bored of your last season's loot and are looking to give your wardrobe an update, we've found five essentials to get those spring summer OOTDs sorted. We're all for shirt dresses. They scream comfort, look so effortlessly cool, and we personally don't think they can ever go out of style. A case in point: This beautiful blue dress. It's the perfect length, the lines add texture to the dress and it's comfort level 100! One of the best things about summer? Ice lollies. If you love ice lollies as much as we do, why not flaunt that love on your footwear too?! This cool pair of sliders is perfect for anyone who loves funky prints and wants to add some fun to their look, all while ensuring comfort too. This satchel in the most soothing blue shade and with pastel pink flowers is definitely a piece that can complete your spring OOTD. It's spacious too and will easily fit all your essentials. It's also the perfect accessory for all your weekend brunches. These earrings are delicate and super unique too. They come in two parts with three slender twines that have a pearl at the bottom. The branch-like resemblance of these earrings is what makes them perfect for spring. Pair them with your breezy dresses to add a feminine touch. 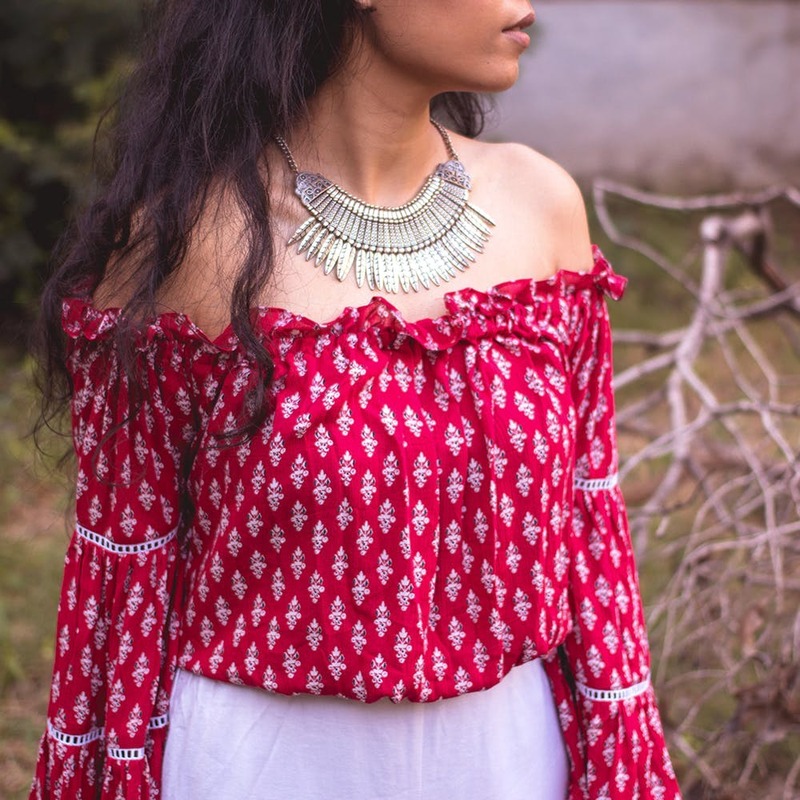 Spring is all about colours too, and this magenta-pink-ish off-shoulder top will add just the right amount of pop to your look. While the flared sleeves and crepe fabric will ensure maximum comfort, the minimal yet feminine print will take care of the style bit.